We really enjoyed seeing these interesting places. Tour guide was knowledgable and friendly. It’s a long day but well worth it. The only negative is we got rubbish seats on the bus. We arrived 20 minutes before tour left and were last of 16 people to board the bus. Which meant we had to sit at the back of the bus in a row of four which was a serious squash and meant we were all uncomfortable. The seats are child sized. We would definitely book again, but next time arrive an hour early and try to board bus in time to get either single or a pairs seat. The driver (Rory) was great, told stories and made an extra stop at the bridges for photos. He kept us on track even though we had a couple stops take long.Sterling castle is less crowded than Edinburgh and we had plenty of time. Loch lomand is beautiful and the distillery was perfect!! Il tour in lingua inglese è stato molto bello soprattutto grazie alla guida Sergio molto preparato e che ha mantenuto anche sempre alta l'attenzione con il suo buon umore. Overall the tour was ok, not not great. Sterling Castle visit was good with enough time. 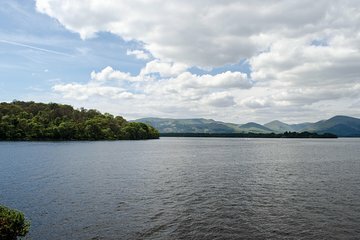 Couldn't get enough time at Loch Lomond for the usual Cruise through the Loch. Visit to Distillery was also good. The guide/driver was quite friendly but should have given more information about the various locations. He missed to give lots of information of major landmarks. this is the one you cannot miss if you visiting Scotland highland guide sergio was filled with information and enjoyed this tour ! Our driver Gary was a recent hire and did a great job. The tour was well paced for all participants. I would have preferred a docent or guide in some places but we attached ourselves to a random group. The Glengoy e distillery was a treat, both from the whisky and our hosts. Humor and love of country were evident from everyone.. Highly recommended! Brendan was a great guide. Very entertaining. Our guide was very knowledgeable but a little formal maybe?? We saw a little of Loch Lomond but all too briefly! And so our evening was VERY stressed!!!! !